The purpose of Alderworks is to enhance the creative process. If you are accepted, how you succeed at creating new or better work is pretty much up to you. What we provide is a simple setting, secluded on the edge of wilderness, that is meant to inspire. If something wonderful comes from this experience, whether a work of art or a jumbled puzzle of brilliant ideas that need more honing, then we are happy and hopefully you will be too. We do ask that you do something for the community while you are here, whether giving a reading, having a small show at your cabin, or hosting a workshop. You also are welcome to help in the garden if you want to. laundry facility with soap for washing your clothes, towels, bedding, etc. Community project – reading, workshop, show at Alderworks with other residents or in town. 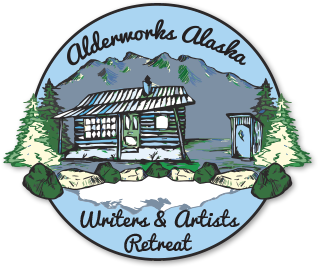 At the end of your residency, we welcome your comments on how to make Alderworks better!